Jimmy Carter’s life has been defined by peace negotiations, hard lessons, and humanitarian work, but our 39th president suffered several close brushes with death along the way. Here are the four times Jimmy Carter almost died from salmonella poisoning after eating egg salad that came in the mail. 1. January 25, 1977—The time Jimmy Carter found a jar in the mail room his first week as president: In an event that could have entirely changed the course of world history, the newly sworn-in President Carter was walking through the mail room after getting lost on his way to the Oval Office, when a reflection of light caught his eye from the top of a shelf. It was a jar of egg salad. The mail room fell silent as Carter stopped in his tracks. A worker asked if he needed directions, but Carter ignored the question and began climbing the shelf. Reasoning that the jar must have been a thank-you from Vietnam War draft evaders, whom he’d granted amnesty four days earlier, Carter began scooping the salad into his mouth. On the fourth scoop, he fainted face forward, his mouth full of the rotten egg mush. White House doctors hooked Carter to IV fluids as Vice President Walter Mondale stood across the room prepared to swear in, until at the last minute, medical staff were able to stabilize and rehydrate the president, who recovered within a matter of days. 2. September 17, 1978—The time Jimmy Carter almost ruined the Camp David Accords: The Middle East was nearly changed forever one fall afternoon in 1978 as Jimmy Carter was walking down a Camp David trail with Egyptian President Anwar Sadat and Prime Minister Menachem Begin of Israel, having just negotiated and signed the famous accords. They walked in silence until Carter abruptly said that a celebration was in order and took a sharp left, leading the group to a field containing a lone mailbox that Carter claimed was his secret mailbox that he had built himself. According to eyewitnesses, Carter told his visitors, “Let’s see if we received anything good,” as he opened the mailbox, pulled out a warm jar of egg salad, unscrewed the lid, and began licking the top layer. Within seconds he threw up and fell over. He was evacuated to a nearby hospital, where doctors were able to save the president before he succumbed to the egg salad’s effects. Had he died that day, there is no telling if Egypt and Israel would have followed through on the agreement. 3. October 28, 1980—The time Ronald Reagan handed Jimmy Carter a single hard-boiled egg: History once again hinged on an incident involving President Carter, this time on the night of the last 1980 presidential debate with Ronald Reagan. As Carter met with Reagan to shake hands ahead of the face-off, the Republican challenger slipped a hard-boiled egg into his hand, whispering, “I got this in the mail. It’s good luck for tonight’s debate. I think unions are haunted.” Carter promptly put the egg in his mouth and swallowed it whole, slapping his neck as it made its way down his gullet. The debate was a disaster for Carter, who responded to every one of Reagan’s attacks with “I don’t feel so good.” During a commercial break, Carter passed out and was rushed to the hospital while his campaign staff persuaded the network to zoom the cameras closer and closer into Carter’s empty podium for the remainder of the debate. Reagan won the election in a landslide. 4. 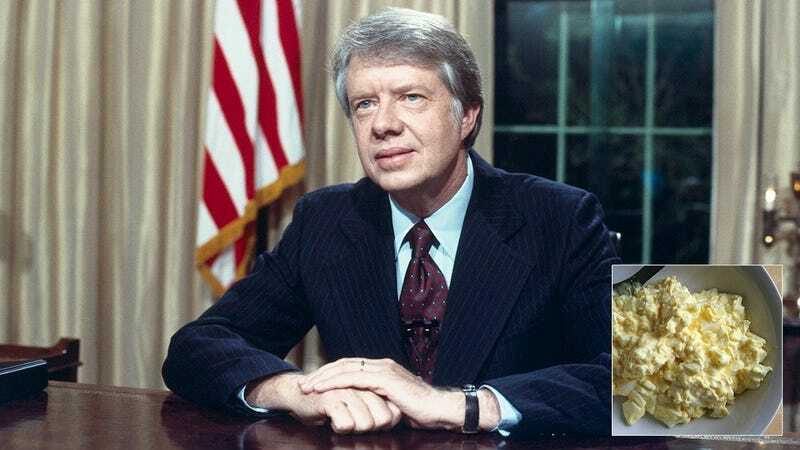 March 4, 1983—The time a bag of egg salad fell into Carter’s mouth: After leaving the Oval Office, Carter soon took up what became the cornerstone of his post-presidential legacy: humanitarian aid. In 1982, as part of a Carter Center initiative to fight malaria and river blindness in third-world countries, Jimmy Carter traveled to Haiti to help volunteers air-drop medical supplies. According to those who were in the same helicopter as Carter, the former president was distracted by a mail bag that he found in the corner of the craft. While they continued to work, he pulled out a plastic bag covered in stamps and screamed “eureka” as they saw that the bag was full of egg salad. The vehicle then reportedly hit some turbulence, throwing everyone off balance and causing the entire bag to jostle into the air and fall down Carter’s throat. He immediately threw up, stumbled out of the helicopter, and was saved by a volunteer who managed to grab him by his shirt collar and hold on long enough for them to land in a nearby village. It was Carter’s fourth close call with death. If things had turned out differently on that fateful day, who knows how different a world we would be living in now.